Brittany Hayes and Mackenzie Vallad started their high school careers with more than the usual adolescent angst. By halfway through ninth grade, both were battling mental illness. Brittany was up against the eating disorder of anorexia. She missed school for most of that spring and the following fall while going to inpatient treatment programs in Grand Rapids and Ohio, and keeping up with her studies at home. For Mackenzie, serious depression caused her to miss two weeks of ninth grade for outpatient treatment. It took a couple months of intensive therapy and two more years of counseling to put the demons behind her. She and Brittany hope to encourage other students to tell someone about their inner struggles. They will speak at an Oct. 22 community forum on mental health at the Rockford High School Auditorium. Brittany and Mackenzie will also present a video at the forum, the first of three scheduled this year in Rockford’s “Developing Healthy Kids III” series. The third annual community education and prevention program aims to open lines of communication and reduce stigma around sensitive issues affecting students, said Kirsten Myers, executive director of special services for Rockford Public Schools. “Families have benefited by receiving specific and important information related to a variety of topics such as mental illness, substance abuse, electronic safety, and parenting tips to support their child through these formidable years,” Myers said. Other programs this year will address how to safely navigate the digital world, presented by author Kevin Honeycutt on Feb. 17, and the danger of over-programming children in a March 20 presentation by family therapist Sheri Moskowitz. 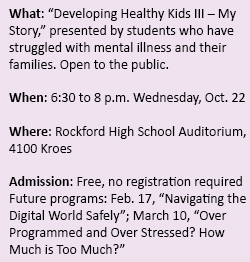 Series topics are chosen by the school district crisis team with input from mental health providers and Rockford Hope, a community and parent group focused on mental health issues. In the Oct. 22 program, titled “My Story,” the students and their families will share their experiences from initial diagnosis to treatment and ongoing support. Mental health agencies and school officials will be on hand to offer assistance to families seeking help. Brittany and Mackenzie said although their friends knew of their struggles, they decided to talk about them more publicly after working with Rockford Hope last year. The Developing Healthy Kids program seemed a good starting point. Her mother, Kim Hayes, said she is proud of Brittany for sharing her experience. Noting it was Brittany’s friends who first told a school counselor they were concerned about her, she hopes other students will be emboldened to seek help for a friend or themselves. Mackenzie got help by confiding in a church youth leader, who informed her parents.